Darryl Carter’s space at the 2014 Kips Bay Show House with its chic daybed, modern coffee table and tasteful occasional chairs. Notice the nailhead trim on the sofa. Photograph by timothy bell. “The house is one of the greatest powers of integration for the thoughts, memories and dreams of mankind,” wrote Gaston Bachelard in The Poetics of Space. What if that house is a mansion with excellent bones? And what if the person integrating its elements is a talented designer? Might normal dreams pale in comparison? If we are speaking of Room 21 at the 2014 Kips Bay Boys & Girls Club Decorator Show House, created by DC-based designer Darryl Carter, my answer is a resounding yes. My favorite space at the 2014 Kips Bay Show House, Darryl Carter’s “The Collected Home.” The juxtaposition of pale accessories and dark tabletops rock! Photograph by timothy bell. 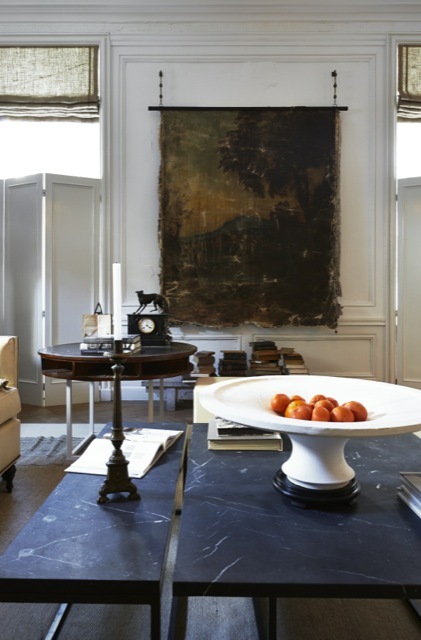 The charm of the third-floor camber, called “The Collected Home,” spoke to me above all the other rooms at this year’s show house, its chalky calmness enlivened by dark flourishes creating a magical chiaroscuro within the backdrop that hints at classical antiquity. I’m looking at the images as I write this and they don’t do the space justice. The feeling that doesn’t come through is how the deep-toned moments of gravity anchored the ethereal room without interrupting the breathlessness it stirred in me. I stood in its center, dreaming that I could curl up on the sofa or stretch out on the daybed and spend the afternoon reading. I wanted this so strongly, I had to force myself to leave. I opened this essay with Bachelard because he was the first philosopher to help me see that those of us who were deprived of exemplary design during our formative years must “dream” our version of aesthetic pleasure into being by paying attention to exemplary examples. I’ve attempted creating my own ideas of allure during my adult life with varying degrees of success—a stone bungalow with a wisteria-draped arbor gracing the back of the home my finest endeavor to date; a clapboard cottage with bead-board framed windows opening to sweeping views of a meandering lake a close second. But each fell short when it came to the interiors. I blame this on distraction. Each time I nested into a new home, the urge to decorate held my interest only so long before my desire to write obliterated all other aspirations. I even went so far as to take a position as a project manager for an interior decorator when I owned the lake house, hoping it would help me learn enough about balance, scale and color to create exceptional surroundings. But the situation took me away from writing so I gave up the effort. It was a dramatic moment in my life because I was surrendering to the fact I would never achieve what Carter had; I simply couldn’t bear the idea of turning away from the thing I wanted most of all—to become a published author. There was no guarantee I’d have had the chops to be the best amongst the best, anyway, and I’m seriously happy I took the path I did. 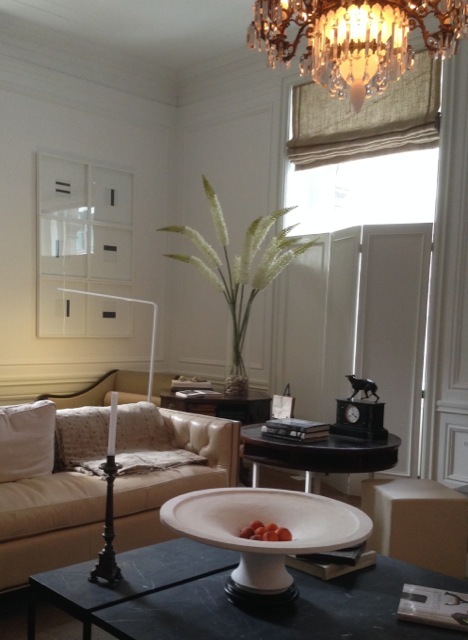 Darryl Carter’s Room 21 at the 2014 Kips Bay show house with clean-lined modern art and an ornate vintage chandelier for a mix of eras and styles. Photograph by Saxon Henry. In his book, Bachelard doesn’t examine interior design, per se, but the philosopher’s ideas inspire thoughts of the subject when he points out that a “material paradise” (whatever that means to each of us) created in a home bathes us in nourishment while creating a compression of time that allows our dreams to take flight. This is what a truly great designer does, I thought as I made my way down the stairs to the entry of The Mansion on Madison and prepared myself for the cruel reentry to the cacophony of New York City. The peace evaporated the second I stepped across the mansion’s threshold, and dissipated further as I strode out of the courtyard it shares with The New York Palace Hotel to join the thousands of other commuters striding along the sidewalks of Madison Avenue. I can still pull echoes of Carter’s magic forward when I think back to the solace I felt when I stood within his space but there was a more important takeaway from the experience I’d like to share: being in that room helped me concretize the realization that extraordinary design gathers us to it in ways that feel preverbal. If you’ve ever had a similar experience as I had at the Kips Bay Show House, how would you describe the difference between rooms that speak to your sensibilities and those which do not? If you are a designer, can you explain your ability to actualize the simultaneous feelings of serenity and buoyancy I experienced as I lingered in that room? The Modern Salonnière and this DesignLabs entry © Saxon Henry, all rights reserved. Saxon is an author, poet and strategist. Her books include Anywhere But Here, Stranded on the Road to Promise and Four Florida Moderns.